These rollers are very versatile having various application possibilities, noiseless and particularly smooth running. The bearings are housed in black colour Polyamide end-caps; they are radial precision ball bearings permanently lubricated, 6002-2RZ std. type or in stainless steel, for shafts up to d.14, 6003-2RZ for shaft d.17, protected by a RAL 1023 yellow colour labyrinth shaped Polypropylene cap. The tube may be in normal steel tube (N exec. ), zinc-plated steel (Z exec.) or in special RAL 7030 grey colour anti-shock PVC (V execution). The spring loaded shaft (D) offers a fast and easy installation on the conveyor. or else the shaft can be drilled and threaded (R) for screw fastening, making a more rigid and strong. assembly. 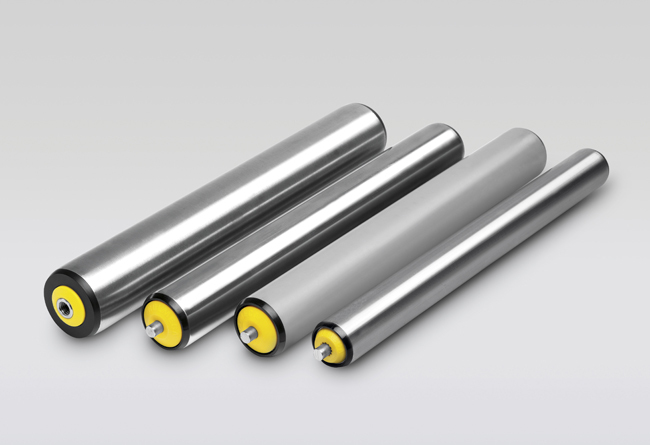 The PVC tube or AISI 304 stainless steel tube also combined with stainless steel bearings is ideal for corrosive, foodstuffs and wet environments. The particular end-caps shape, the accuracy of the assembly and the type of bearing used make these rollers particularly strong and allow them to behave correctly even in driven and belt applications. Application temperatures range from –5° C to +80° C for steel tube and from –5° C to +50° C for PVC tube; working conditions must be verified for applications in lower temperatures. We suggest conforming to the standard executions and lengths; for different executions please specify: the type, the shaft diameter and execution, the tube diameter and execution, the “C” length.